Nurse will be available between 7:30 am and 2:00 pm. Voice mail can be reached at any time at the above extension. To report an absence for all grades, call 973-694-3702, then press #201, before 8:30 am on the first day of absence. Medical notes must be received within two weeks of the doctor visit. Post dated notes will not be accepted as a medical excuse after that time. Health screenings will be conducted during your child's health or physical education class. We expect to begin screenings in the first week in September and finish by March. All 12th grade students will receive copies of their immunization records before graduating (for future reference). Any student who has not received the state mandated immunizations will be excluded from school. Transfer students must present complete records of immunizations upon registration and prior to attending classes. Request for copies of immunization records will be made within 48 hours of request. No student is permitted to carry any medications during school hours. All medications must be administered by the nurse in the health office. This includes Tylenol, Advil, Lactaid and Benadryl. Only those students who have presented the proper signed forms for an inhaler or Epi-pen use may self-carry their specific medication. The Asthma Action Plan and Epi-Pen/ FARE forms can be obtained through our website or Health Office. Please anticipate the student's need for medication for headaches, cramps, body aches, or other discomforts. Medication Administration forms are also available in the Health Office, or on our website under “Health Forms”. These are to be signed by a parent and also by a doctor for over the counter and prescription medications. This form must be properly completed prior to any medication administration. No phone consents will be accepted. All medications brought to the Health Office must be non-expired, clearly labeled, and in an original container. Any student needing an inhaler, epi-pen, insulin, or any medication for allergic reactions must provide the nurse with a signed Individual Health Care Plan (available through the Health Office), and the separate permission form previously discussed for self-carrying. Any student who has used these medications in the past at our school, should have received these forms over the summer months to be returned in the fall. Please send in completed forms and medications as soon as possible. Students who have specific medical problems that might need nursing intervention and special teacher consideration might need to have an IHCP on file for each school year. Parents need to review these plans with their medical Doctor, and return them, signed and dated, quickly. Changes can be made in these plans at any time. Students who had medical conditions needing an IHCP last year need to update the plan for this school year. An IHCP can be initiated at any time during the year, as new medical needs arise. Please contact the health office with questions or concerns. All sports injuries and all medical notes must be submitted to the health office within 48 hours of the injury. The Athletic trainer works with the nurses, and submits all medical notes to our office. Medical notes must be received within two weeks of the doctor visit. Postdated notes will not be accepted as a medical excuse after that time. 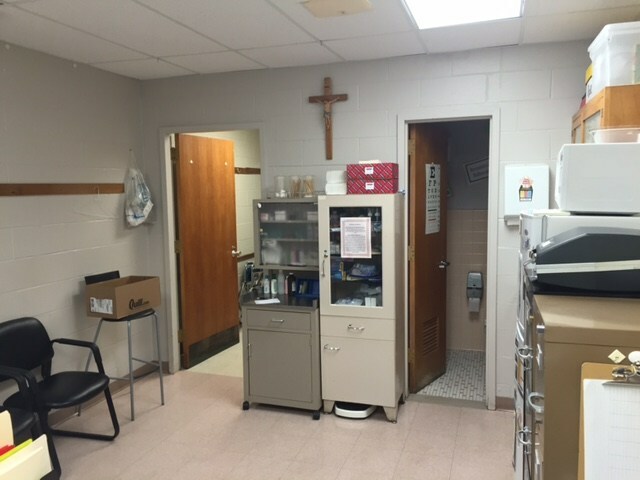 To properly care for the health and safety of your child and to meet the requirements of DePaul Catholic High School/Wayne Board of Health, a complete annual physical examination is required of all students each year and is good for one full year (365 days) for both school/field trips and sports requirements. Your child may be asked to return home if these forms are not in place by the first day of school in September. Therefore please mail, fax or personally deliver these forms to our health office as soon as possible. These forms can be downloaded from the “Health Forms” section in the Health Office tab. There you may click on these PDF forms for printing.  Parent Portion: PRE-PARTICIPATION – HISTORY FORM.  Physician Portion: PREPARTICIPATION PHYSICAL EVALUATION – PHYSICAL EXAMINATION FORM must be completed by your child’s physician. Many doctors will ask that the Parent portion is filled in and submitted with physician portion before he/she will finalize their portion. We recommend that you make a copy for your own records. Please Note to All Athletes: As of 5/1/15, your physicians or practitioners performing physicals for student-athletes must have completed the “Student-Athlete Cardiac Assessment Professional Development Module” (please check that they have taken this module before performing your exam). In Order for the physical to be considered valid for athletics in New Jersey High Schools, the physician or practitioner must sign and date the section under “Clearance Form Page” that states: “Completed Cardiac Assessment Professional Module”. The Module is from the “State of New Jersey Department of Education and Health”. Please include a copy of your child’s insurance card (both sides). Other forms that may apply to your child’s health and safety that you would need to bring to your child’s physician for a signature are: Medication Administration form (dispensing medication to your child during school hours, including over-the-counter medications), Allergy/Epi-pen form, Asthma Action Plan, Diabetes Medical Management Plan and Seizure Action Plan. These forms are also included in the “Health Forms” section in the Health Office tab. If a student also wishes to participate in sports activities, additional forms are required and are included on our website. All necessary forms must be submitted at least one week prior to tryouts/practice (whichever comes first) or clearance cannot be guaranteed in time for participation. Please contact us with any concerns or questions about the health of your student.